Where were you born? In Toronto. How long have you been in the business? In November this year it will be 31 years. I started at Alba Tours in res, handling charter flights to Cuba, Acapulco, Italy and Greece. And when a sales position came up I went for it. Where else have you worked? 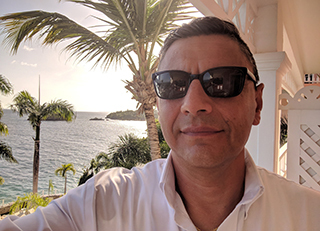 At Alba for 9 years, then to Sunquest for a year, Signature for 13 years, Sears Travel head office for 2 years, and now 5 years with Bahia Principe under the umbrella of Quadra Innovations. How many people work for you? I have one helping in English Canada and one for French Canada. What’s the best part of the job? The camaraderie within the travel industry. What did you want to be as a kid? A vet. I’m a big animal guy. What was your first ever job? I worked in a supermarket as produce manager. What’s the scariest thing you’ve ever done? Negotiating a contract with Cubans, in Cuba, using my very limited Spanish. It was quite a thing. Any guilty pleasures? Yes. Excessive eating! I love to sample international cuisine and I’ll never shy away from anything. What’s your favourite airline? KLM. I had a great experience with them going to Greece – especially when I got an upgrade to business. What’s on your tablet? I have Netflix. Very addictive. Binge watching is a bad thing. I binge watch Grace & Frankie. Hilarious. What do people not know about you? That I played the accordion for five years and I cut a record and I was on Tiny Talent Time. And yes, I did wear a bow-tie. Any hobbies or interests? Gardening. And I’ve recently taken up painting. Who do you most admire in the industry? Wow. There are so many trailblazers, especially women. It’s hard to name just one. What skill or talent do you admire in someone? The ability to speak to people and make them feel comfortable. To take a negative experience and make it a positive one. What’s at the top of your bucket list? Iceland. Ever had a brush with fame? Many times. I’ve had the opportunity to meet a lot of Canadian rock performers such as Rush, Triumph, Saga. What keeps you awake at night? Nothing. I sleep well and am able to purge things from the day. What is your greatest extravagance? Dining out. My love for food, again! How do you stay fit when you travel? Walk, walk and more walk. I average, when I am away, between 10 and 15 km a day. I do not stand still – much less flop on the beach! If you could change one thing about the industry what would it be? The reservations systems that some of the airlines and tour operators use need streamlining. We’re still not there with technology. If you could sit next to anyone on a long-haul flight, who would it be? Could it be three? Jesus Christ, Mohammed and Buddha. Do you have a favourite charity? I sponsor a child in Indonesia through World Vision. What will be the biggest challenge for the industry in the next 12 months? Weather. I think we are going to be in for some super-sized storms again. What do you hope to be doing in 10 years? Escorting groups to various areas of the world. I like sharing experiences with people!